Unsurprisingly, the Coalition's franking credits scare campaign is working. Once again, sensible tax reform is sacrificed on the altar of short-term politics and the absence of a holistic approach. Once again, politics gets in the way of policymaking, and fear and obfuscation are winning. 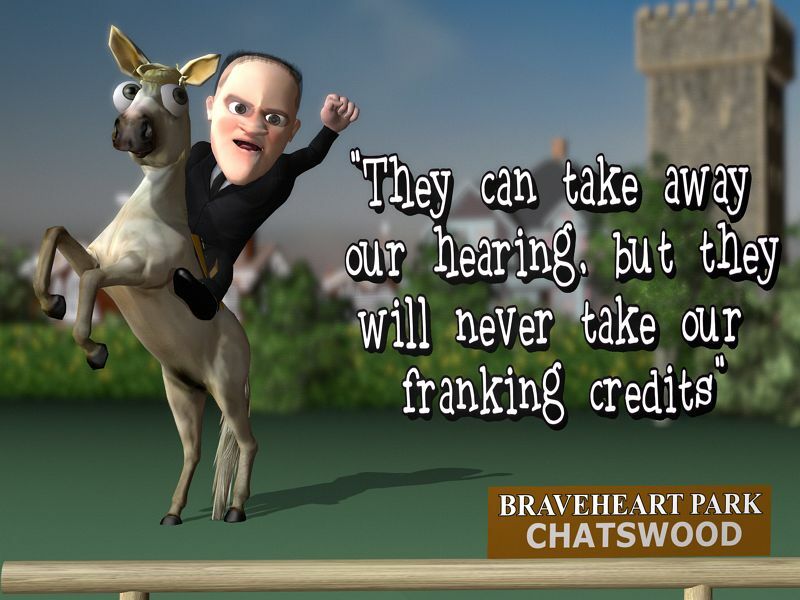 As reported by those who have attended the so-called "Parliamentary Inquiry", 'Inquiry into the implications of removing refundable franking credits', led by Liberal Member for Goldstein, Tim Wilson, facts take a back-seat to whip up a frenzy of fear. This is all designed to paint the Labor Party as the bad guys and the enemy of pensioners — a rather significant category of voters. Dividend imputation was originally introduced by the Hawke-Keating Government as part of a tax reform package in 1987. It removed double taxation on dividends paid to shareholders from after-tax profits, which was previously taxed again by the recipient. The system enabled the tax paid by the company to be offset as a tax credit by the shareholder receiving the already taxed dividend. Removing double taxation seemed like a good idea at the time, but the rules have changed over the years, making it more and more complex. Also, as company tax on profit is a flat 30 per cent, the other effect of the system was that it benefited those on a higher marginal tax rate more than those on a lower rate. Originally the benefit of the tax credit was limited to offset other income, but in 2000 the Howard-Costello Government changed it so that dividend holders could get any excess credit beyond the offset as a cash refund from the tax office. It is now a silly system but, of course, as all things related to taxation, companies and people will – as is their prerogative – take full advantage of it. Hence dividend imputation (tax credits) have become an integral part of planning for share investors, small and large. Labor's proposal is to remove the cash refund (basically returning to pre-2000 rules), claiming that it mainly benefits retirees who have considerable retirement savings but low taxable income as they draw down their superannuation funds (which is taxed when accrued). As this analysis from the Grattan Institute shows, Labor's claim holds up, whereas the Government's claim of it hurting "low-income retirees" is inaccurate. But it is still a silly move by Labor. It was designed primarily to increase revenue, not to simplify the tax system and the attacks on it by the Coalition were inevitable. It is silly because it doesn't take into account all the intricacies of our taxation system. The dividend imputation issue is complicated by a superannuation regime further convoluted with every new federal budget; to the delight of tax accountants and the chagrin of those tasked with administering it. What is needed is a fundamental root and branch review of our whole taxation system. What is needed is a brave government that is prepared to lift their gaze above the immediate needs of revenue generation, budget surplus reductions and whatever is politically palatable at the moment. As is customary for such documents, the Henry Review was consigned to the too hard basket, sucked up in the "longevity vacuum" — the absence of long term planning that has beset Australian governments for decades. Rudd did try to invoke one of the main recommendations in 2010: a resource rent tax. Ill-conceived in its proposed implementation; it was rushed through as a "super profit tax" which made it an easy target for the inevitable scare campaign by the LNP Opposition and of course the mining companies. It possibly ended up costing him his job, Julia Gillard then watered it down and the end result was nothing like what was envisioned by the original tax reform recommendations. Since then, no government has dared touch desperately needed, comprehensive tax reform. A Labor government (any government) needs to change that position and stop the endless tinkering around the edges of a flawed system. While we remain a prosperous nation in a rapidly changing world, we can afford to take our time to get it right, not just "get on with the job". Kim Wingerei is a former businessman turned writer and commentator, and author of ‘Why Democracy is Broken: A Blueprint for Change’. You can follow Kim on Twitter @kwingerei or on his website, kimwingerei.com. 12 February 2019, 11:00am Unsurprisingly, the Coalition's franking credits scare campaign is working.